The other day my sis-in-law was planning to cook chicken biryani. She called up my husband to ask if he was ok with it. I asked OK? He will be exhilarated. Happy to the extent that he would dream about the biryani on his way back home and his mouth must have sweated already thinking about the yummy dish. Unfortunately my sis-in-law could not get time to go to the market and get the chicken. Thinking about the expression of disappointment that would show on my charming husband’s face if he would have had to eat ghiya (bottle guard) for dinner, I started brain storming for more options that could be cooked. To my respite I found some cauliflower in the refrigerator and no I was not going to make the north Indian staple dish; aloo gobhi. 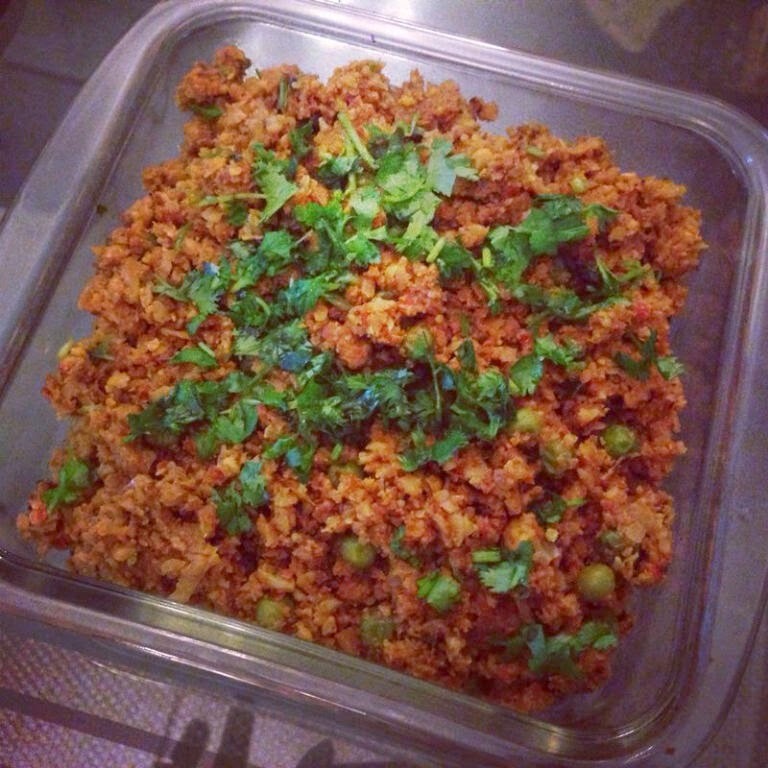 My mom often makes Gobhi Keema. And it is purely vegetarian. I, however, did not know the recipe. All I knew was that the cauliflower was grated in this version. So I thought to give the dish a shot, making it my own way. That way my husband would also be happy that he got to try a new dish. The dish tastes really good and the effort required is not much. My husband enjoyed his dinner when I made him tandoori lachcha paranthas (type of Indian flatbread) with the dish. He forgot about the biryani! Yayiiee! This is a really nice menu option when you are inviting someone over for lunch or dinner since the more poplular aloo gobhi is quite common. Also you can use the leftover keema to make sandwiches the next morning. Believe me they make an awesome breakfast. If you give these sandwiches to your kids in their lunchboxes, the lunchbox will come back empty. Guaranteed. This is how you can get your own portion of Gobhi Keema. Put a spoonful of oil in a pan. Add grated cauliflower to it. Give it a good stir, reduce the flame and cover the pan to let the cauliflower cook. On the other side, put the remaining oil in another pan. Add to this grated onion. Cook till it golden. Add ginger garlic paste and cook for another few seconds. Follow by pouring in the pureed tomatoes. Cook till the tomatoes reduce a little. Add salt, turmeric powder, red chilli powder, chicken masala, coriander powder, garam masala and cumin powder. Save a spoonful each of coriander powder, garam masala and cumin powder for later. Once the spices are cooked, add the cooked grated cauliflower to it and mix it all well. Add some readymade tomato puree, boiled peas and the granulated soya to the pan and mix it all well. Add the remaining coriander powder, garam masala and cumin powder. Cook for another few minutes. Add chopped fresh coriander leaving a little for the garnish. Transfer the gobhi keema to a bowl. Garnish it with fresh coriander. I have used olive oil since I wanted to keep the dish light. If you are cooking this for a luxurious dinner, replace the olive oil with ghee and use a few extra spoonfuls of it. You can also use white butter if that is available. If you do not have granulated soya but have the soya nutri nuggets just crush them roughly with a rolling pin and soak them. This will do the needed. Soya basically add the meaty texture to the dish and makes the experience great for the vegetarians. Make sure you add salt to the water while boiling peas. Looks tempting, will try it. good receipe, i will try it.